Alesis have just announced a brand new all-in-one electronic drum pad: The Alesis Strike MultiPad. This is a powerful full-featured electronic drum multipad, allowing drummers to add electronics to their live performances, record and edit samples, or build a fully functional mini electronic drum kit for gigs, parties, and practicing. 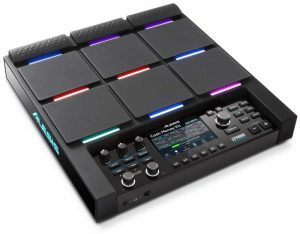 Alesis give you nine velocity-sensitive drum pads on the unit, each with its own customizable RGB light (to help you see it on a dark stage). There are five built-in effects processors (see the specs section below for the full list). Effects include three kit effects, one master effect, plus compressor and EQ controls. 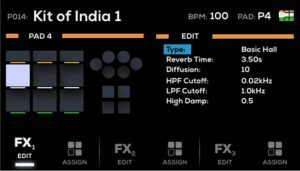 Independent and mappable control knobs, allowing you to assign your controls to the effects you want to access for live tweaking (plus dedicated headphone and master controls). Two headphone outputs: One 3.5mm and one 6.35mm, so you don’t have to worry about carrying adapters for your headphones. A built-in metronome that can be sent to either the headphones, the main output, or both. A built-in looper letting you record and loop long and short performances, and create complex tracks to use when performing or practicing. The Strike MultiPad features a large 4.3″ colour display, to help you navigate the features, record and edit sounds, and create loops. Alesis have included both Pro Tools First and Ableton Live Lite, to open up the recording potential of the Strike MultiPad. One of the coolest features is the powerful on-board sampling. You can record sounds directly to the Strike MultiPad, and then edit them directly on the unit to ensure they sound exactly as intended. Alesis have made it as easy as possible to get sounds into the MultiPad: You can record samples by plugging in your phone, via USB, microphone, or any other audio device. The recording input can be set to either mic or line-level and includes a gain control, to ensure your samples are captured properly. You can also load WAV file samples via USB. With a lot of recording and sampling, you’ll need a lot of storage, and Alesis have put a huge amount of space on the unit for samples and backing tracks. The Strike MultiPad comes with 32GB of storage (which works out to be well over 24 hours of sounds). 6GB of space is dedicated to the built-in sounds – you get over 8,000 samples and loops to use right out of the box. The built-in sounds cover drums, percussion, and melodic instruments, along with loops to help inspire some creativity. Alesis have made the Strike MultiPad very expandable, with plenty of inputs either for triggers or for creating a powerful mini electronic drum kit. Alesis give you 3 cymbal/drum pad inputs, a hi-hat pedal input, and 2 foot controls. The pad can be used as a brain for controlling a fully-featured electronic drum kit, for triggering samples on your acoustic kit, or for anything in between. Interestingly, the unit can also be used as a basic audio interface – it has a 2-in and 2-out USB audio feature. There’s also the usual MIDI in, out, and thru. 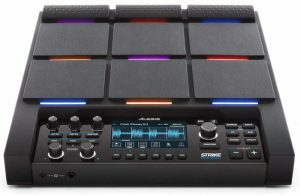 Put together, this means you can use the Alesis Strike MultiPad to record direct to your computer, or use it to trigger samples using drum software like EZDrummer or BFD. It’s nice to see Alesis have included some lite versions of Pro Tool and Ableton to help with this: Drummers will have everything they need to get recording right away. The Strike MultiPad supports 16bit mono and stereo WAV files (with a sample rate of 44.1KHz). Audio output routing for pads, triggers, and footswitch (routing options include main+headphones, effects 1-3, aux+headphones, or headphones only). Metronome with BPM control for beat playback. Two layers of samples per pad, trigger, and footswitch. Mono & poly sample playback options. Volume, pan, fade in/out, velocity, and priority controls for each sample. Sample editing: Trim start/end of sample, change tempo, zoom while editing, normalize sample, pitch adjust, reverse sample. A “Panic” control instantly stops all sounds on the device (helpful if you trigger the wrong backing track live!). Control mode function for pads to allow tap-tempo, toggling effects, and loop control all by hitting a pad. Retrigger, crosstalk, mask time, and scan time settings for all pads, and head/rim control for dual-zone pads. The Strike MultiPad is 13.75″ x 14″ x 3″ in size, and runs on 100-240V AC power (9V DC power adapter included). See the Alesis Strike MultiPad’s full user guide here (pdf) for the full specs and details. We’d love to get our hands on one of these to run a full review of the Alesis Strike MultiPad. In the meantime, check out Alesis’ website here for more information. See our guide to electronic drum pads to check out Roland and Yamaha’s similar all-in-one pads. Previous PostPrevious New Article: Does A Drum’s Wood Actually Matter? Next PostNext Hate Tuning Drums? WTS Drums Are Made For You!